I’ve been gettin’ crafty this week, and St. Patrick’s Day has given me the excuse to do it! That and sick kids over Spring Break…means Mommy needed to keep us busy! One of the projects I just finished was a cute little festive sign I thought I’d share with you! I had this little wood plaque that I bought at Walmart a few weeks ago. I don’t really have St. Patrick’s Day decorations, or really that many for Easter either, and thought it would be kind of fun to make my own! 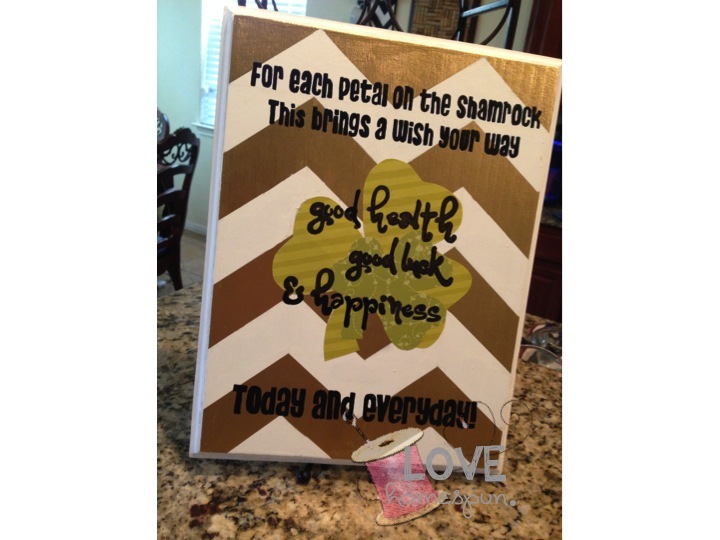 I painted it white, added some gold chevron, and some scrapbook paper shamrocks, and it turned out really cute! 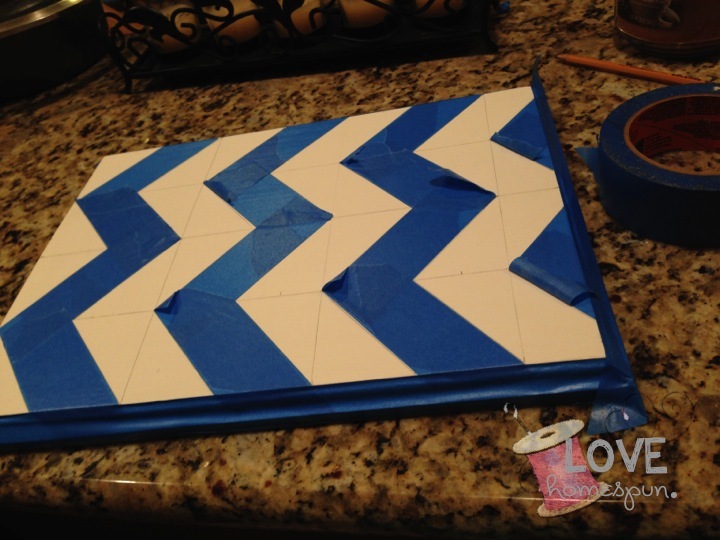 Here’s how I painted the chevron. First, I did a coat of white paint. Then, I measured my board (which was 10×13 ‘ish) and measured straight down the middle first. I wanted my points to look even, so I divided the shorter side into 2.5″ sections. I then divided the longer section into about 2″ sections. Since the longer side wasn’t as even to divid up evenly, I just got as close as I could. 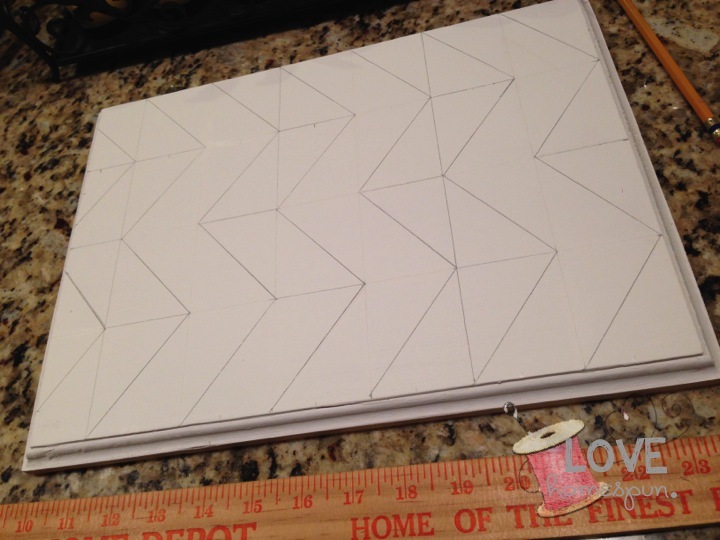 (This will be how thick your chevron stripes will be.) After you mark your board, you have a bunch of small rectangles drawn all over your board. Next, I sectioned each rectangle into equal triangles, rotating the direction of my line as I moved along from left to right of my board. (Or you can section the first row, then switch directions and section the second row. The point is that you don’t want any two rectangles next to each other, to have lines drawn in the same direction. 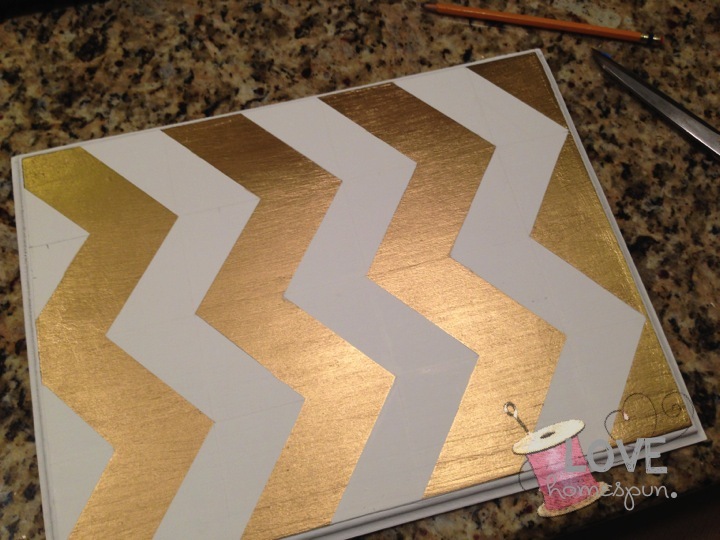 I decided that I wanted to start my board with the incomplete chevron on top, and that I wanted to start with gold. So skipping every other zig zag line, I erased the rectangle marks drawn on my white paint. Now comes taping. My chevron strips were a TINY bit wider that my tape, so I began by lining up one side (long side) of the tape with one line in the stripe. It’s almost impossible to get your tape to lay perfectly straight (it stretches a bit), so just fill in your lines the best you can using one straight side as your guide. 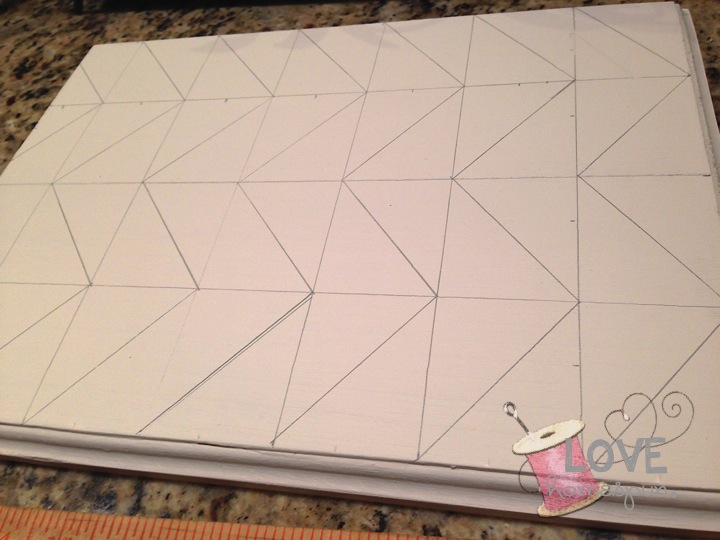 I ended up using A LOT of tape…but that’s ok…the more tape the cleaner lines you’ll have! I covered everything that I wanted to stay white with tape. Set your board up, to dry overnight. You can then decoupage paper or a photo onto it, paint another design on top, or even just leave it for a cool little wall art design. To do the letters, I used the chalk and ball point pen method…but really I WANT A CRICUT! SO bad! It’d be perfect for this stuff! It was really fun to do, and really easy! Came out very clean, and now I think I will go paint chevron all over everything!